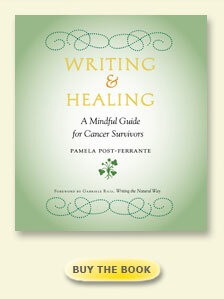 Marie Pechet reviewed my book Writing & Healing: A Mindful Guide for Cancer Survivors on WBUR’s CommonHealth Blog a few years ago. In the review she mentioned her blog which was helping with her own cancer. There was a link; I clicked and have been following her ever since. As I am blogging for a time for breastcancer.org it seemed a great time to showcase Marie with a piece about connections. Many years ago, I had a late miscarriage and during my depressed state afterwards, I joined a mind-body group designed for women who were trying to get pregnant. These groups were initially formed to help reduce the stress of patients diagnosed with cancer, but then expanded to other stressful health situations. So I joined a group focused on fertility. The program met once a week for six weeks, and I started with about as much enthusiasm as I brush my teeth. Actually, less; it was a last-ditch effort to get out of my “funk.” Our group shared our stories and we practiced meditation, yoga, journaling and other ways to reduce our stress levels. Once the six-week program finished, I found myself emotionally connected to the group, and many of us decided to continue meeting to support each other’s efforts to build a family. When sending an email that might announce either a pregnancy or a failed attempt, use the subject line “I have results.” Then each person could decide when and if to read it. There was no pressure or expectation to respond to any email or verbal comment. Respond if you are so moved. But know that you are being heard. Listen with open hearts and without judgment, helping us to speak honestly and from our own hearts. At first, we met every week in one of our homes. In between meetings, we stayed in touch by email. Though we were from all walks of life and had varied interests, our almost-constant contact deepened our ties. As time went on, our meetings became less frequent, moving to every month, then once a year, but our emotional ties remained strong. We became a group of women who could support each other with unconditional, non-judgmental love. We had been through the wringer and in our group, we could drop any façade of bravery or perfection and could air even our ugliest, most embarrassing feelings. We knew that each of us was more than any bad experience, and that the ugly feelings were not who we were, just a by-product of working through a difficult time. We initially connected around our desire to have children, but soon we connected over normal life changes. We found ourselves supporting each other in decisions like whether to live child-free, struggles with marriages, deciding to get a divorce. So when I got a cancer diagnosis, I turned to them. 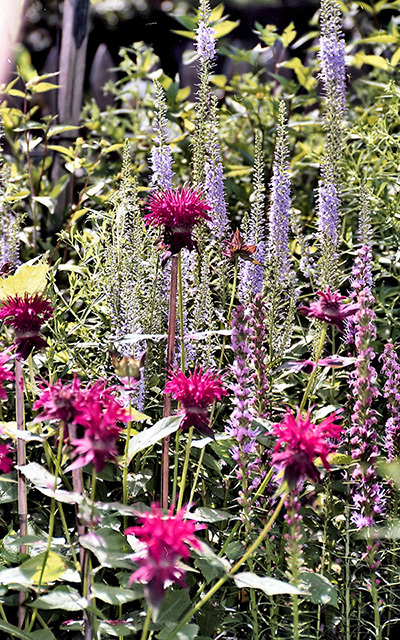 I could share my myriad of emotions, and knew that I would feel heard and supported. The doctor told me to call today to get the results, so I called but couldn’t reach him. I didn’t worry about it. I have enough experience to know that, if the doctors have news for you, they will track you down. But THEN…the doctor called me. At 8:30 p.m. on a Friday – that can’t mean good news. Maybe it was professional courtesy, since my husband is a doctor. Nope. The polyp was, indeed, cancerous. He feels like they got it all, but it was really close to the colon wall and he recommends surgery to removed that part of my colon, just to be sure. He will coordinate with my primary care physician and we’ll see what the next steps are. It is nice to have an answer, so at least I know where to go from here. When I got the phone call, I had just finished watching a lecture that left me feeling pretty upbeat. I was riding on the good feelings from that, which softened the blow a bit. Instead of being stunned, I actually felt fortunate that they found this and that it is a curable disease. So, a reminder to live while we are living! Sounds upbeat, right? But they knew me, and they knew I was still scared at some level. Not everyone answered my email messages, but I didn’t need that. 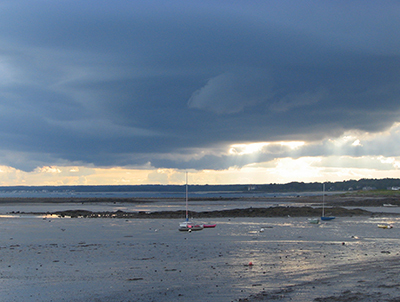 I just needed a place to air my feelings and, during a time when one can feel incredibly alone, I knew that I wasn’t. One or two responses felt like support from the whole group. Writing to these dear friends helped me through the scary initial diagnosis. A few weeks later, when I wrote about my dilemma around where to get treatment, they could decipher, through my writing, which way I was leaning, and they helped me to see what I couldn’t. During a period where I didn’t write, they showed up AT MY DOOR with food and healing objects and conducted a healing circle for me in my livingroom, and the memory of that gesture that still brings me to tears. As much as I wanted to be strong and self-sufficient, I learned that I cannot walk this path alone. Our interconnectedness carries me like a net. Many of the tools we learned as a group have become a way of life for us. For some, physical movement like dancing or other exercise is critical. 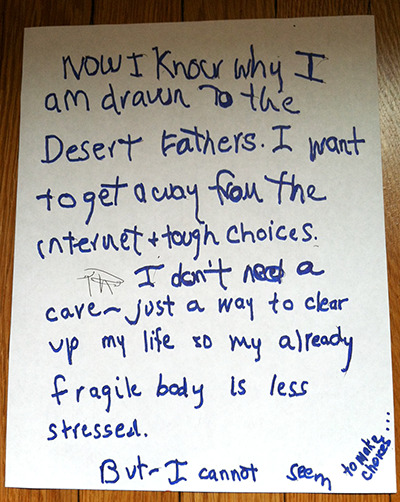 For others like me, writing became a way to understand myself and manage stress. As more friends learned about my diagnosis, I started to include them in my email updates (which have now become a blog). I appreciate those who read it, and those who respond, and my writing truly helps me to make sense of my life situation and to heal. And each time I begin to write, I connect to the Treasurehunters with my heart, and speak directly to these women with whom I feel blessed to walk this earth. Marie Pechet is married and the mother of two school-age boys. They live together in Cambridge, MA, where she tries to do something every day that heals her body or soul. It feels like winning a Pulitzer Prize. 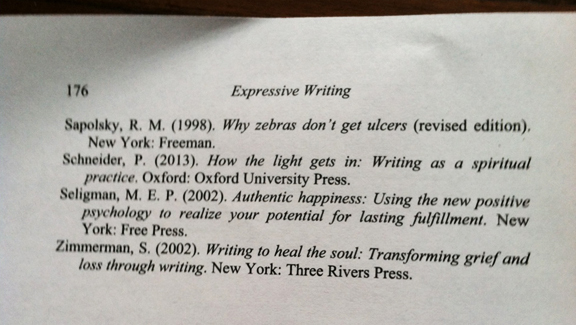 James Pennebaker has included my book, Writing & Healing: A Mindful Guide for Cancer Survivors, in the recommended Reading List of his new book, Expressive Writing: Words that Heal. To me, he is a hero, as the first psychologist to bring writing into the area of health research. My book is with nineteen prominent titles. I am thrilled to have my book honored in this way. 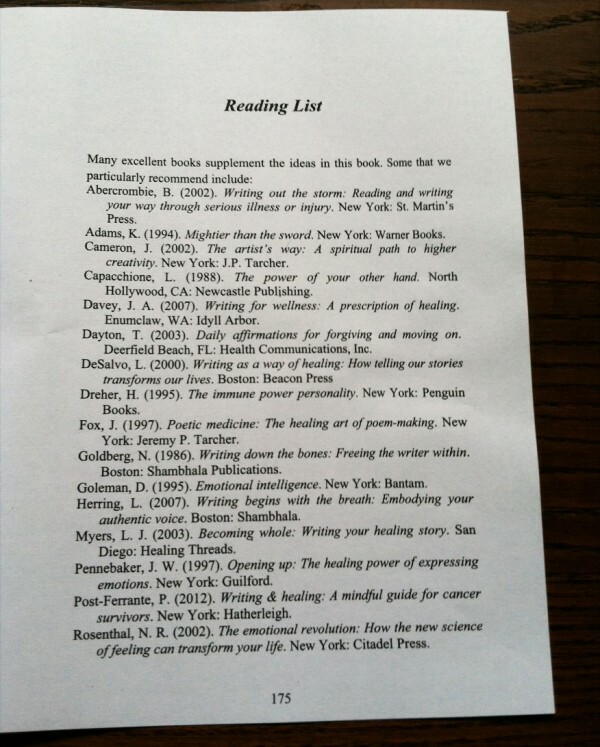 Page 2 of the reading list. 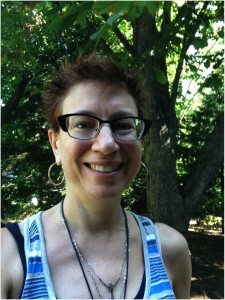 For the next few months I will be talking about writing and healing as a guest blogger at www.breastcancer.org. I post there about every six weeks. The folks at Breastcancer.org love my book and see it, as I do, as being all about healing. It could be used by any group or person, but since I am a cancer survivor, I chose to offer it to this population. 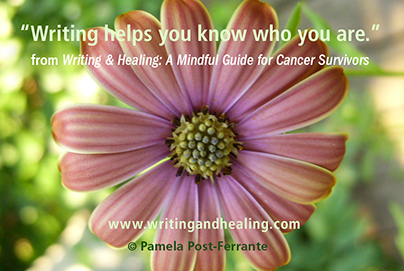 The blogs focus on the Sessions in my book, Writing & Healing: A Mindful Guide for Cancer Survivors. As well, they will include a short exercise. Just posted is my second guest blog post, “Prompting the Healing Power of Writing” It can be found here. To follow will be “Healing Breath”in August. The first blog post is “Writing & Healing: Using Mindfulness and Creativity to Become Whole Again“. Please check it out here. life force. The stories we tell make a difference. When you write from a “prompt” you create a “story,” which means you are creating “fiction” and not consciously writing about yourself. In this way, the imagination is free to dip into the unconscious and write about something not fully known to you. Then, because it is the prompt’s story and not yours, you are more able to identify that the dried rose or sea glass is feeling what you feel too; you just hadn’t known it until you heard it. This technique sometimes allows pushed-down or stuck material to emerge as “story,” but usually only at a rate that is comfortable. Or, it might be just a storyabout a piece of sea glass. If I give you a sheet of paper and at the top it says, “Write How You Are Feeling” you might scan your body and say “tired” or remember you are angry at the person who cut you off in traffic today. If I were to give you an autumn leaf and ask you to give the leaf a name and write about the leaf, you might say that it is full of brilliant colors or you might say that it is curled andfurled at the edges and you are on your way to rolling yourself up. No one else can tell you what your stories are. You alone know. Sharing of our writing, we help each other heal. Sometimes when someone is sharing a story, you realize that what they wrote is true for you, too. You just hadn’t known it. Please add your comments or stories in the comment area. …is to open windows and let another’s words drift in. 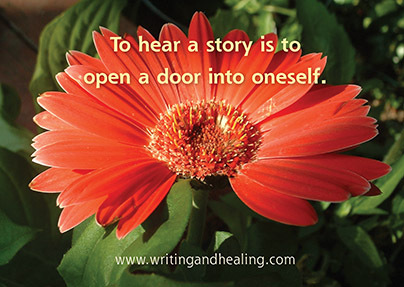 To hear a story is to open a door into oneself. 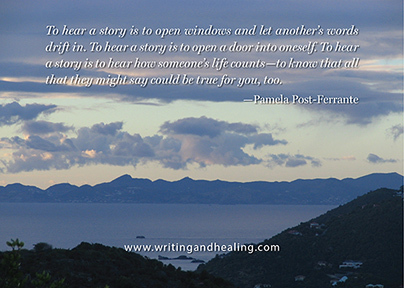 To hear a story is to hear how someone’s life counts—to know that all that they might say could be true for you, too. For the next few months, I will be blogging as a guest blogger at www.breastcancer.org. I will post there, about every six weeks. The first one Writing & Healing: Using Mindfulness and Creativity to Become Whole Again is already up; there will be six more. The folks at breastcancer.org love the book and see it, as I do, as being all about healing. It could be used by any group or person, but since I am a cancer survivor, I chose to offer it to this population. Learning to Witness another’s story. Listening deeply is witnessing and needs to be learned and practiced. 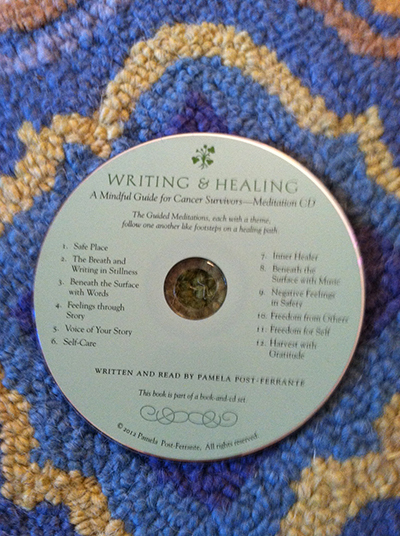 I am blogging about whatever ails me or assists me using the Sessions of my book for all Healing and not just cancer. I can’t find my important words. Have I misplaced them? I can no longer hear them, not even a whisper….. Have they moved so far away because of my neglect of meditation and breath-work? My back, with its strains and pains was better last weekend. I even got into my car for the first time in almost two weeks. I only drove to buy gas and a roasted chicken for dinner. But what a happy drive. I felt freed. I was out in the world. Alive! Later, I took a walk outside along the river—not too far—just far enough to feel a surprising, out of nowhere, wild wind on my face. It felt like a bit of grace. Then, I went to the physical therapist the next day and the exercises he gave me made me much worse. My back in spasm. 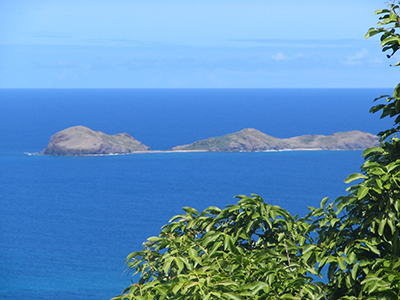 I had been about to post the blog about being freed when I was returned to captive. I will use the meditations in my book to help find some words about my injured back. Writing has always helped. Breathing has always helped. 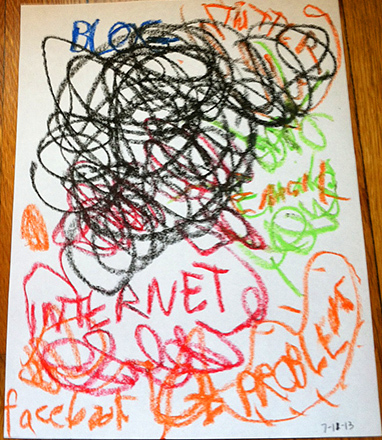 Here are the words that came after the drawing. 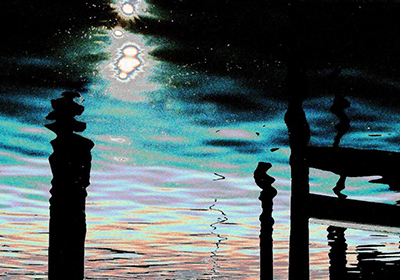 “Stillness, after out-breath number twenty, is like softly pooling water soothing my pain. I also seem to have released the negative thoughts I was sure would come. My back aches, pulls and freezes my every move. I feel stopped and pulled down when I need to be doing so many things. The pain is where I ruptured a disc 25 years ago. I know the pain routes: back, buttocks, down the right leg and into the ankle. I had a L5S1 rupture; a piece of disc ending up on a nerve so serious they felt they couldn’t operate without risking permanent leg pain. I have an addition all these years later — a spasm in my upper back where they removed part of my latissimus dorsi on each side (the biggest supporting back muscle as well as attaching to the shoulders). They cut and dragged part of this muscle to my front for each reconstruction after cancer surgeries. My back and shoulders are further destabilized and my arms are weaker than they were. My back works wonderfully well, considering. But for the last two months it has on and off tightened and ached. Spasmed and pained. In getting well from that first injury long ago, there were good things. That is when I first learned to meditate and spend much of a day in beautiful silence. When my children, 3rd and 6th grade, came home from school I helped with homework and played Go Fish from my bed. It was a simple time. Now I am supposedly approaching my golden years, but I am busier than ever. My back gets a little better, and then worse. It won’t go away and I won’t give in completely. I feel agitated by my lack of productivity. It is my book. I need to market it. To stop now would be like giving birth to a baby and then deciding it was too much trouble to raise. And anyway, the book is about healing. So much need for all sorts of healing. It helps with all physical illnesses, emotional turmoil, ( grief, divorce, loss). How about backs? 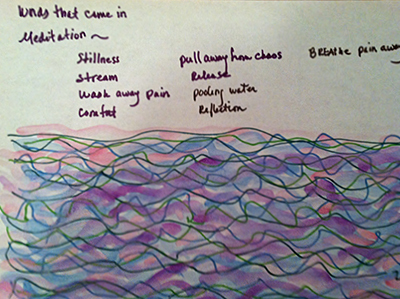 I realize I am still writing about Sessions Two: Breath and Stillness. “Breathe into your tension so that you can know it.”* This line stays with me and since the tension is pain, I ride the breath into it. “IN…OUT…” After awhile I know it is exhaustion, too. Pain and exhaustion. Please leave a comment . . . I went on a silent retreat to learn about the Desert Fathers and Mothers of the 4th Century; to learn more about total, sustained stillness. It was a book of the collected sayings of the Fathers that initially interested me. It intrigued me the way these Fathers remained so silent and so immobile for so long (life times). I was drawn to them. To what they were doing. I read they developed a deep sense or awareness of their feelings and perhaps what others felt, too, deep down. They became aware of things we never touch the surface of. Perhaps I romanticized them. But we do move too fast, talk too much, eat too much, filling all the empty spaces. This is what I wanted. I had 3 1/2 days. I doubted I would get far, but I’d dip my toe in. There was another aspect that involved Intention. What was my intention for the retreat? 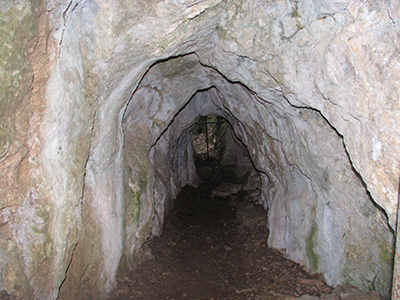 I didn’t have to think long to tell the Brother, who would be my guide, that I wanted to discern what to eliminate from my too busy life and head (since I knew I’d never end up in a cave). I was provided with a room, desk, wooden chair, bed, and bureau. 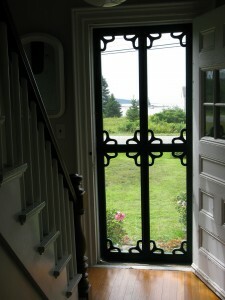 I had a lock on my door and remained silent, except to talk, once a day, to my retreat director. 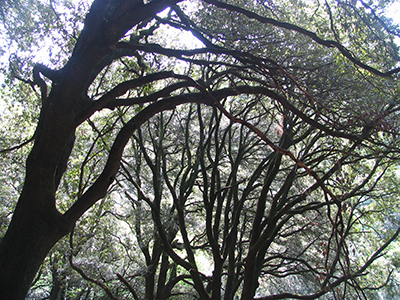 On other retreats during the day I practiced following the breath, sometimes with a mantra. I almost seemed to float during those times. I brought my iPhone so my family could get in touch if they needed to. (Big mistake.) Not that they got in touch at all. It was my problem. I saw an email from someone who takes care of posting my words on my blog. It simply involved something that she could see on my blog and I couldn’t. I became obsessed with this technical problem, although I knew nothing about technical solutions. There was something obsessive about this. I was truly agitated. Agitation was not tolerated in the desert, I remembered. Of course I’d read that the Fathers and Mothers had demons to wrestle with (demons within themselves) but I had never imagined mine would involve the Internet. 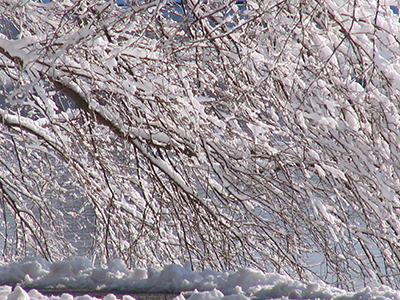 I dwelt in frenzy — just the opposite of what I’d experienced before in retreats or my own practice. I participated in more emails that soon involved a third person, my webhost. I then put my iPhone under my clothes in a drawer, as if it were an illegal substance—and maybe it is—or at least what it did to me should be withheld. No slow hand written words—thought carefully through and put to paper with ink with no chance of a response for days. Instead, addictive words flew back and forth and back and forth like they never could before. Technology and the Internet had seen to that. And, I’m hunt and peck typing with a stylus on an iPhone—like punching something over and over. Fast and hard words. Can they break . . . these words? No, but I can break using them this way. Having them come at me this way. But, of course, this was my demon and I had to fight. With patience, they said. I had little of that. The Desert Fathers and Mothers insisted on discipline. I had little of that, as well. These were all opportunities to practice. Well, I still had my iPhone hidden in a drawer under my clothes. Maybe what I experienced in a rocky spiritual afternoon was just an exaggeration of what I was retreating from in my everyday life. 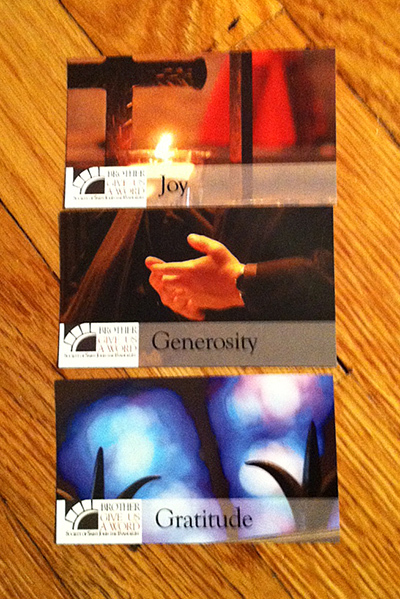 So, I drew a picture of what I was feeling, wrote a left-handed confession and took pictures of some little cards in the Retreat House that represented what I wanted. And, I began to calm down. The breath came and went and I settled for the rest of the retreat. After two more days I wasn’t sure what had happened, but I had found my retreat rhythm and inner stillness. On Saturday morning it was time to go home. I got what I had come for. I got word, on Monday, that over the weekend my website had experienced an attack that my webhost had averted, but my site had to be shut down over the weekend. Gone into silence. Into stillness . . . Please leave a comment if you wish . . .